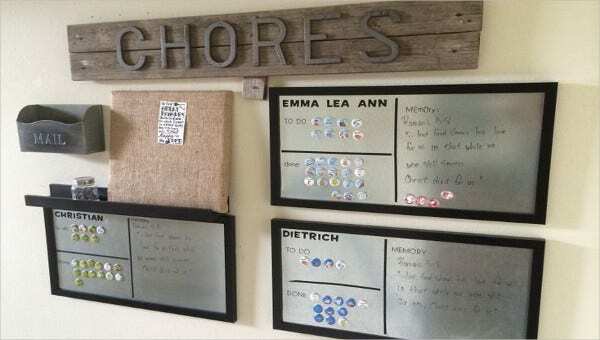 Like other kinds of organizational charts, chore charts are a useful tool for organization. These charts should allow you to arrange all the many chores that need to be done in a way that allows everyone in a given household to contribute. This way ensures that everyone pulls their own weight. This kind of Excel chart needs some parts to make it work. This includes the obvious parts such as the list of chores proper, but such a chart also needs a schedule for each task, as well as a list of names so as to assign each task to a given person. Divide chores up evenly. This ensures that everyone in the household does their part in terms of basic upkeep. Assign chores by age. This is most relevant in the case of family chore chart templates, as it ensures that chores are distributed according to age. Plan out chore charts in advance. This allows you to set up chore duties ahead of time, and creates a consistent system. Be specific concerning each chore, so as to spell out exactly what needs to be done at all times. First list all the necessary chores for your own household. List all the people living in the household, and their schedules. Create a schedule for the chores, and assign each task an appropriate time. Weekly chore chart templates would be useful for this. Assign each person to a specific task based on age, availability, and skill set. Make sure that tasks are distributed fairly so as to ensure that every person contributes. While you can use printable chart templates and other tools like them, it would pay to know what such charts can do for you. This way, you have a more concrete idea of the capabilities of such chore charts and how they can help keep your life more organized. Provides a consistent system. Having a chart in the first place allows you to order all the necessary tasks around a house, so as to be more organized and systematic concerning the task of upkeep. Distributes work fairly. This allows you to ensure that everyone does their part, so that everyone can bring their unique skill set to the table. This also goes some way to avoiding only a relative handful of people taking responsibility for upkeep. Fosters a sense of responsibility. Using and following a chart can impart responsibility to everyone in the household. After all, everyone would need to pull their weight in order for the household to function. Is a flexible tool. Using simple chart templates allows for personalized charts applicable for any household. This also allows for adjustments in the event that chores need to be rearranged for any reason. With these tips, you should have an easier time making and using such charts more consistently now that you have a better understanding of how they work.